Once upon a time, every window on a Mac desktop had big, easy-to-click and impossible-to-miss scroll bars that never, ever disappeared. Since 2011’s “Lion” update to Mac OS X, however, Apple has adopted an “barely there” policy when it comes to scroll bars. 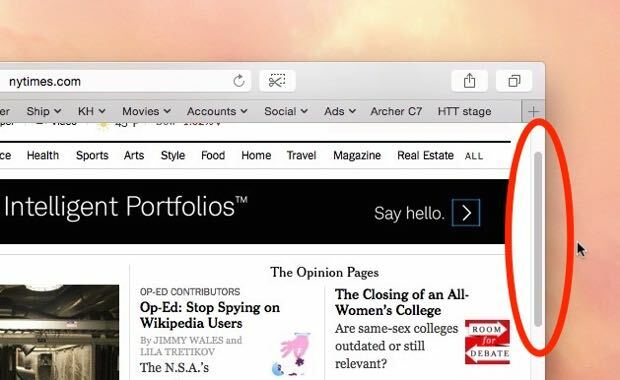 Indeed, scroll bars on the Mac are now just as wafer-thin as they are on the iPhone and iPad—and in some cases, they may disappear completely when you’re not actively scrolling. 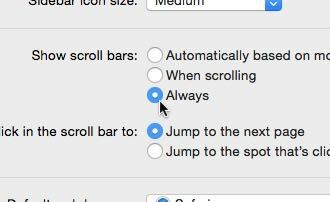 Luckily, it’s easy to get those scroll bars back—not the old, larger versions, mind you, but at least you can keep the Mac’s new, skinny-mini scroll bars visible at all times. Click the Apple menu at the top-left of the screen, then select System Preferences. Next, select the General preferences pane; it’s the very first one, up at the top. Go ahead and select that last “Always” option. You’re done! Wish you could get the missing scroll bar buttons back, too? You can’t, unfortunately, but you can always use your arrow keys for precision scrolling. Click here for more Mac tips!